It is not always possible to anticipate the actual environment in which a metallic structure will operate. Even if initial conditions were known completely, there is often no assurance that operating temperatures, pressures, or even chemical compositions will remain constant over the expected equipment lifespan. The complexity of corrosion processes and their impact on equipment often buried or out-of-sight complicates many situations, rendering simple life prediction difficult. Even corrosion tests carried out in controlled conditions often yield results with more scatter than many other types of materials test results because of a variety of factors, an important one being the effect on corrosion rates due to minor impurities in the materials themselves or in the testing environments . 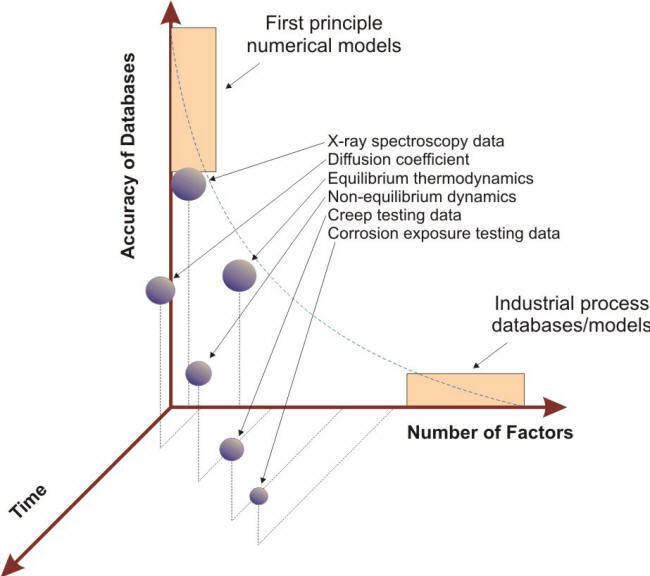 The accuracy of data against testing time and number of factors presented in the 3-D plot shown in the following Figure illustrates the relative difficulties associated with reproducing industrially realistic corrosion problems. This intrinsic complexity has made the transformation of corrosion testing results into usable real life functions for service applications a difficult task . In most chemical reactions, an increase in temperature is accompanied by an increase in reaction rate. A rough rule-of-thumb suggests that the reaction rate doubles for each ten degree Celsius rise in temperature. Although this rule has many exceptions, it is important to take into consideration the influence of temperature when analyzing why materials fail. Changing the temperature of an environment can influence its corrosivity. Many household hot water heater tanks, for example, were historically made of galvanized steel. The zinc coating offered a certain amount of cathodic protection to the underlying steel, and the service life was considered adequate. Water tanks seldom were operated above 60oC. With the development of automatic dishwashers and automatic laundry equipment, the average water temperature was increased so that temperatures of about 80oC have now become common in household hot water tanks. Coinciding with the widespread use of automatic dishwashers and laundry equipment was a sudden upsurge of complaints of short-life of galvanized steel water heater tanks. Electrochemical measurements showed that in many cases, iron was anodic to zinc above 75oC, whereas zinc was anodic to iron at temperatures below 60oC. This explained why zinc offered no cathodic protection above 75oC, and why red water and premature perforation of galvanized water tanks occurred so readily at higher temperatures. This particular problem was partly solved by using magnesium sacrificial anodes or protective coatings, and by the replacement with new alloys. Unless otherwise protected, metals generally owe their corrosion resistance to a tightly adherent, protective film that builds up on the metal surface by corrosion processes. This film may consist of reaction products, adsorbed gases, or a combination of these. Any mechanical disturbance of this protective film can stimulate attack of the underlying metals until either the protective film is reestablished, or the metal has been corroded away. The mechanical disturbance itself can be caused by abrasion, impingement, turbulence, or cavitation. Erosion-corrosion is encountered most frequently in pumps, valves, centrifuges, elbows, impellers, inlet ends of heat-exchanger tubes, and agitated tanks. Locations in flowing systems where there are sudden changes in direction or flow cross section, as in heat exchangers where water flows from the water boxes into the tubes, are likely places for erosion-corrosion. Under these conditions, which stimulate some corrosion of the metal surface, the effects of flow velocity may be to displace the corrosion products, thereby exposing fresh metal to the corrosion action of the solution. This action may lead to a much increased corrosion rate. Impurities present in minute amounts have often more influence on the corrosion behavior of materials than substances present in much greater quantities. Sometimes impurities in trace quantities may accelerate the corrosion attack while at other times they may act as inhibitors. The introduction of small amounts of ions of metals such as copper, lead, or mercury can cause severe corrosion of aluminum equipment, e.g. corrosion of upstream copper alloy equipment can result in contamination of cooling water. Under these circumstances, copper can plate out on downstream aluminum equipment and pipe, setting up local galvanic cells which can result in severe pitting and perhaps perforation. Microbes are present almost everywhere in soils, freshwater, seawater, and air. However, the mere detection of microorganisms in an environment does not necessarily indicate a corrosion problem. Nonetheless, it is well established that numerous buried steel pipes have suffered severe corrosion as the result of bacterial action. In unaerated or anaerobic soils, this attack is attributed to the influence of the sulfate-reducing bacteria (SRB). The mechanism is believed to involve both direct attack of the steel by hydrogen sulfide and cathodic depolarization aided by the presence of bacteria. Even in aerated or aerobic soils, there are sufficiently large variations in aeration that the action of SRB cannot be neglected. For example, within active corrosion pits, the oxygen content becomes exceedingly low. Bacteria, fungi and other microorganisms can play a major part in soil corrosion. Spectacularly rapid corrosion failures have been observed in soil due to microbial action and it is becoming increasingly apparent that most metallic alloys are susceptible to some form of microbiologically influenced corrosion (MIC). The presence of aggressive microbes may also be quite severe in industrial water-handling systems, e.g. cooling water and injection water systems, heat exchangers, wastewater treatment facilities, storage tanks, piping systems, and all manner of power plants, including those based on fossil fuels, hydroelectric, and nuclear . 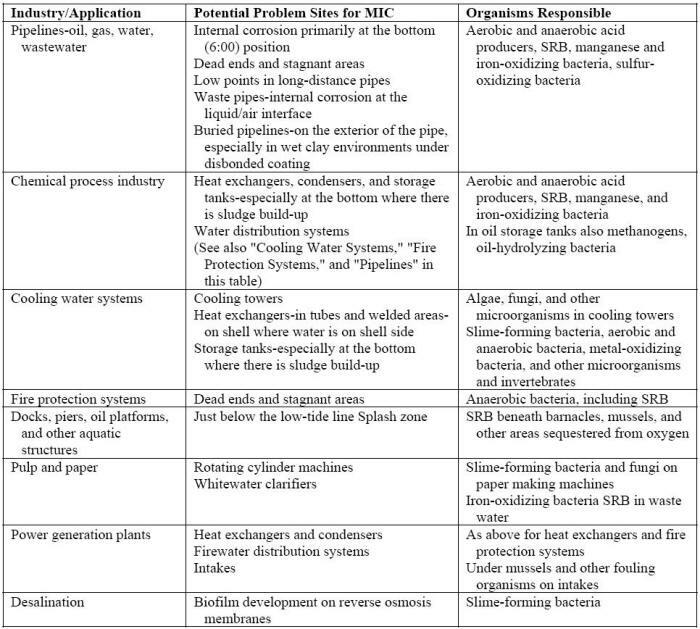 The following Table lists potential problem areas by industry . The corrosion resulting from stray currents coming from external sources is similar to that from galvanic cells that generate their own current. However, stray current strengths can be much more damaging than ordinary galvanic cells and, as a consequence corrosion may be much more rapid. Stray currents causing corrosion may originate from direct-current distribution lines, substations, or street railway systems, and flow into an adjacent metallic structure. Alternating currents very rarely cause corrosion. Another difference between galvanic-type currents and stray currents is that the latter are more likely to operate over long distances since the anode and cathode are more likely to be remotely separated from one another. Seeking the path of least resistance, stray currents from a foreign installation may travel along a pipeline or any other buried metallic structure causing severe corrosion where it leaves the line or current carrier.